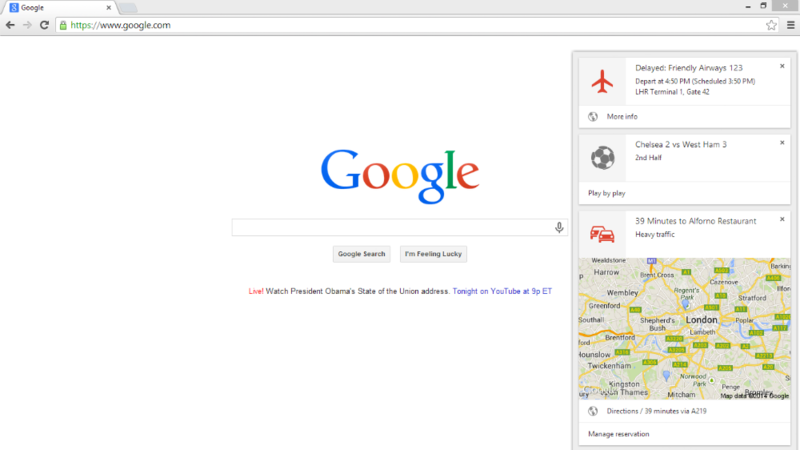 Google’s Chrome team announced the availability of Google Now for Chrome Beta users on desktops this morning. Google Now is a helpful app that brings important information you care about right to your attention without you having to ask for it. For example, you can keep an eye on upcoming flight plans, daily commute traffic, and even track shipments making its way to your house. Google Now has been an Android user’s best friend since launch, and now, it’s available for Chrome desktop users. How do you get it? Simple! Make sure you are using the Chrome Beta app for Windows, Mac, or a Chromebook machine. The feature is auto enabled, so all you need to do is click on the bell icon on your desktop or numbered box on a Chromebook. From there, you will see all of your Google Now cards. If you aren’t already running it, you can download the Chrome Beta app for desktops right here, and if you don’t feel like running the beta, we are sure that Google Now will makes its way to the general Chrome app shortly.